This page is dedicated to all of the wayward stories that have yet to find a suitable home. Maybe you know a compassionate and loving editor who would be willing to adopt them. If so, please feel free to contact me through this site. The lever that releases our towrope is pulled and I see the 200 feet of nylon fall away in front of me. Our tow plane, a single seat aircraft that once saw service as a crop-duster, veers off to the left, the rope trailing behind it like a lazy tail. Our umbilical is cut and we are free to soar. 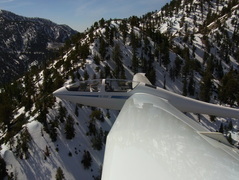 We’re at 9,500 feet and just north of the snow covered San Gabriels. “That’s the San Andreas Fault down there,” my pilot, Dale Masters announces from behind me. I look down to the zigzag line that cuts across the terrain a vertical mile below us. With memories of the 9.0 magnitude Japanese earthquake still fresh, I consider wryly that this is probably the best place to be in relation to a fault that could split half of California off into the ocean………………….. The foul odor of the sulfur vents assaults my senses, smelling like a wayward and neglected outhouse and making me sick to my stomach. I was tired, weak and suffering from altitude sickness. My tentmate had kept me awake the previous night with her constant tossing and turning and I was dehydrated, triggering my first ever bout with “The great equalizer” of mountain climbing. 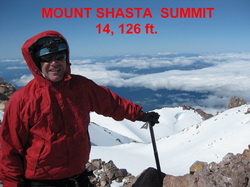 Yet here I was, just a couple hundred feet below the summit of Mount Shasta, at 14,179 feet the second highest volcano in the contiguous United States. Mention the term “Ring of Fire” and some people might think of Johnny Cash’s gravelly 1963 hit or the Hawaiian Islands. But the same pyroclastic forces that created our fiftieth state and added that last star to our flag, extend to our mainland and wind their way through the Pacific Northwest like a string of potent pearls……………….